Sergeant John Moore poses with the final score of 3-0, Washington Capitals win! For John, the Soldier Salute segment was surreal. 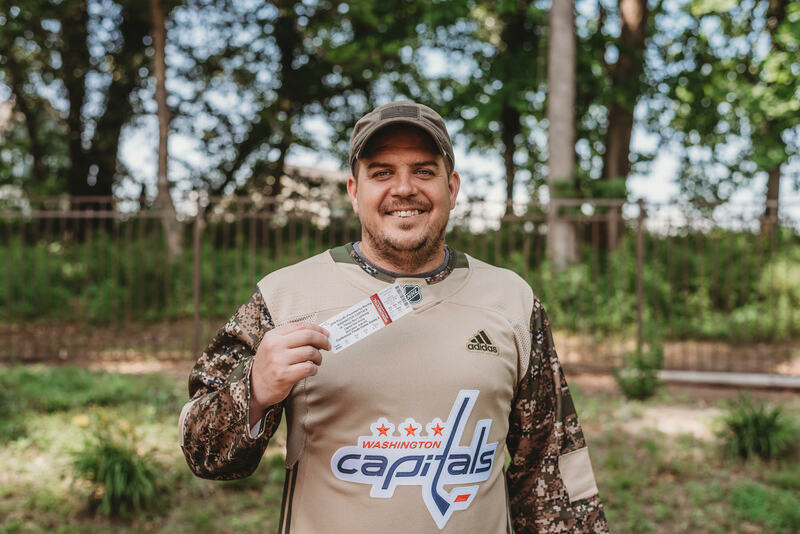 “My friend agreed that the crowd cheered louder then than at any other point in the game!” NHL Hall of Famer Rod Langway, a former Capitals player who twice was named top defenseman and earned the nickname “Secretary of Defense”, appeared next to John during the segment to give him a special camouflaged “LANGWAY” jersey. 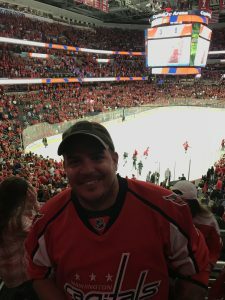 The Capitals defeated the Tampa Bay Lightning and as John was exiting the stadium, Caps fans kept stopping him to shake his hand and thank him for serving. “One little boy asked his mom if he could take a picture with me,” John said. “It’s up there with the top five things I’ve done in my life,” John said.